Local Ghost Hunters Claim Florida House is Haunted . South Florida Sun - Sentinel. Fort Lauderdale, Fla. The questions have been whispered among those who work there. What was that noise? Did you hear that door close? Is the Stranahan House ... haunted? Stories have persisted for years that spirits -- the souls of the formerly living -- linger in the 100-year-old home where Fort Lauderdale pioneers Frank and Ivy Stranahan lived. Late Sunday night, a group of local ghost hunters using their spirit-searching devices concluded the long-told tales are true. To them, the haunting was as obvious as the stars and the dark river outside, where Frank Stranahan drowned himself when the city was young. "We're being watched,'' said Shaun Jones, founder of South Florida Ghost Team. Jones, a 38-year-old electrician and part-time ghost hunter, pointed to a ghostly "orb,'' or ball of light, her digital camera captured in the house's courtyard, near busy Las Olas Boulevard at 335 SE Sixth Ave. The Stranahan House, an icon of old Fort Lauderdale, is one of the most prominent assignments for the fledgling ghost team. Attracted by a tip from a fellow believer, Jones sought permission to investigate, and Executive Director Barbara Keith gave her consent. "Ivy's here,'' said Jones, who does the work at no charge. "I know she's here. I felt her presence.'' Jones will issue a report of the ghost hunt, with details of the evidence of spirits. Keith isn't sure what to believe, or what to do about Jones' conclusions. "I'm intrigued, yes,'' she said. "I want to say they're nuts, but at the same time ... '' Back in 1900, when 52 people lived in this city, trading post operator Frank Stranahan married school teacher Ivy Cromartie. He killed himself in 1929, after his bank failed and the money he owed his friends was lost. Ivy died in her sleep in 1971 in an upstairs bedroom. Her father, Augustus Cromartie, also passed from this world in that bedroom, now a gift shop. The ghost hunters met outside Sunday, over the U.S. 1 tunnel that dips through the river. A light glowed from upstairs, and the group got excited -- until Della-Cerra told them it was just an indoor "Exit" sign. Once inside, the group split up, looking for evidence. It came many times, in many ways, they thought. Like the gift shop: "When we first came in, there was an impression in the chair,'' Dan Cronin, a 36-year-old health adviser, said excitedly, as he flashed light onto an empty, cushioned chair. "And we smelled a perfumey, lilacy scent. Now it's gone.'' He silenced everyone. "Do you want to say something to her?'' he asked Denise Muhammad, 35, a telephone customer service worker, holding out a voice recorder. "Ivy? Are you here?'' Muhammad asked. "Are you with us? Can you say something to us? Can you give us a sign to let us know you're here with us?'' Silence. Stacy Snyder, 23, a law firm administrative assistant, had the dousing rod, which is supposed to aim at spirits. "This is going back and forth,'' she said as the thin metal rod veered about. Later, the sweet, flowery, powdery smell returned. Jones sensed Ivy's presence. "She just brushed right by me,'' she said. Most of the members of the South Florida Ghost Team said they had supernatural experiences when they were young. Snyder, for example, was awakened by a spirit on her bed when she was 10. Muhammad had an out-of-body experience. Cronin saw visions and specters outside a family beach house when he was 6. Jones saw the devil. Other ghost groups undergo training at conventions run by the International Ghost Hunters Society. But the South Florida group has had no training and wants to get established first. The equipment they use, though, is standard for ghost seekers: a digital voice recorder with external microphone, digital cameras, dousing rods that point toward spirits, devices that pick up electromagnetic fields, sensitive thermometers, flashlights, and their own five -- or six -- senses. Jones tells her group to remain skeptical and look for a logical explanation first. Then, if there isn't any, enjoy the rush. Joe Nickell, senior research fellow for the Committee for the Scientific Investigation of Claims of the Paranormal out of Amherst, N.Y., says the groups operate on a "logical fallacy'' -- that what is unknown is supernatural. "The mere fact that something's unexplained is proof of nothing,'' said Nickell. "We don't know what the sound in the house was, therefore it's a ghost." Fort Lauderdale's James Randi, a nationally known debunker of the supernatural who goes by "Amazing Randi," has a standing $1 million offer to anyone who proves a paranormal occurrence. He discounts ghost hunters and their "orbs" as fakers and bad photographers. Orbs can be faked with dust or moisture. A strand of hair or cobweb or smoke or mosquito can create hair-raising photos, he said. 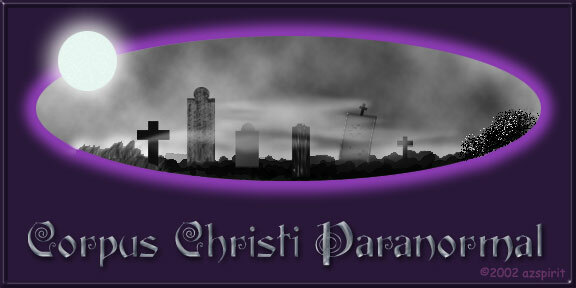 Copyright © 2002-2003 Corpus Christi Paranormal, All rights reserved.